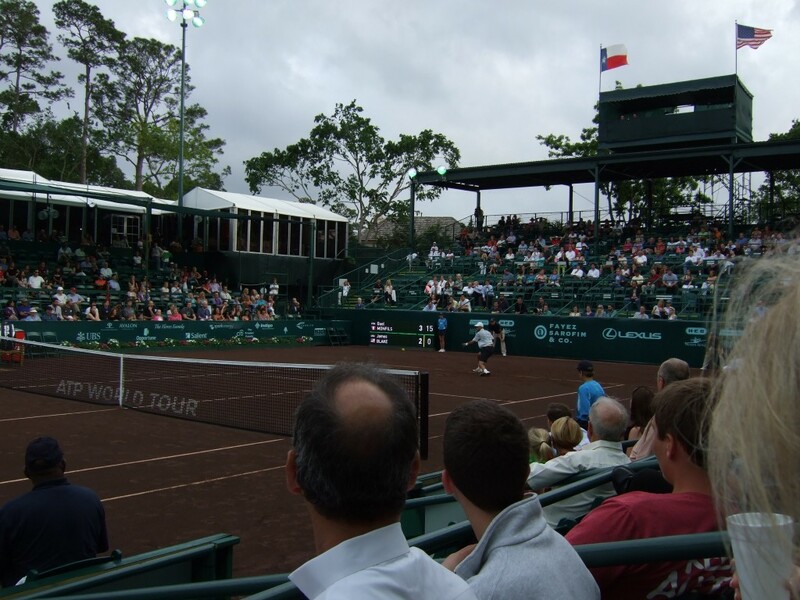 I still remember that moment on Friday afternoon, when I was standing in the doorway of the tiny ATP office under one of the main stands of the Stadium Court at the River Oaks Country Club. I wasn’t sure what was happening, but I heard two familiar names announced one after the other. One was “Blake,” and the other was “Monfils.” Soon after, I learned that they were the first two names picked during the entire draw process, and that they would meet in the first round. Which is rather unfortunate for an event like the Men’s Clay Court Championship, which even in a strong year like this isn’t flush with huge names. However, in that misfortune there was an opportunity. Blake-Monfils could be the night match on Monday, and give the event a most perfect kick-off party. Blake-Monfils was set for a not-before-6 p.m. start time on Stadium Court. I had just finished this week’s edition of the Backboard at around 4 p.m., so I headed out to the food vendor stand to get my daily meal. As I ate, I noticed something: there were a lot of people walking around the grounds. As they say, there was a buzz going around the River Oaks Country Club. I then walked over to Court 7, where a crowd was already gathered. 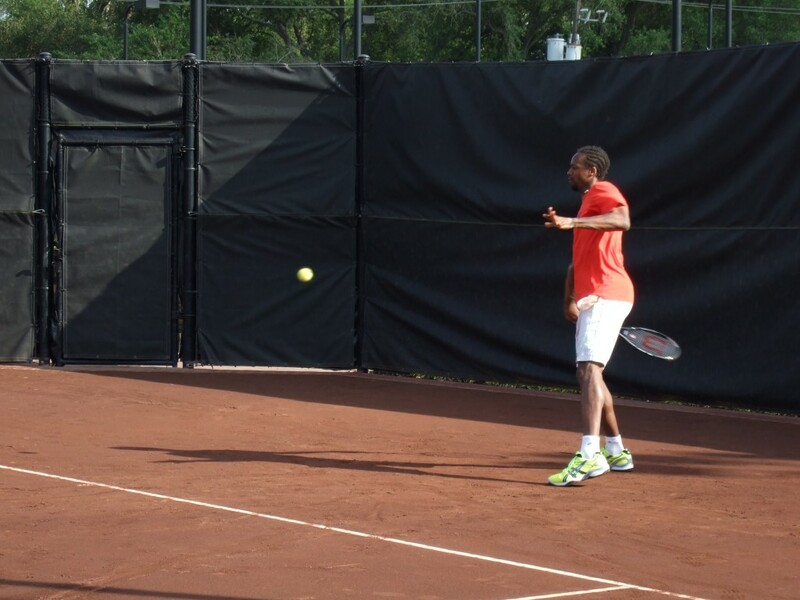 Turns out, Gaël Monfils and Josselin Ouanna were practicing. In a moment of complete brain malfunction on my part, the first thing that popped into my head was that Monfils was being nice and warming up his friend, who was set to play the second night match against Tim Smyczek. Even though I had been looking forward to Blake-Monfils since the draw was made, and even though I’d arranged my evening so I could be in a good position to catch that match, I completely forgot about it. Once I came to my senses, I noticed a few things. First, Monfils wasn’t hitting the ball all that well. Second, he was barely smiling. He seemed tense, nervous. Worried, even. Which is understandable, given the fact that Monfils hadn’t played since losing in the first round of Marseille, an event that took place on the week of February 18. Also, the marquee night match wasn’t simple by any means and it represented his first ever match at the Men’s Clay Court Championship. About this last point, the dark red clay at River Oaks is very, very “different,” as Monfils himself said later in the presser, from the European red clay Monfils is used to (before coming to Houston, Monfils had practiced at Roland Garros, and then in Lausanne with Stan Wawrinka). Regardless, the warmup continued to develop without incident, so I decided to move to the Stadium Court to get a good seat for Blake-Monfils. Soon after I sat down in one of the lower level boxes (I was told that as press, I could sit anywhere I wanted on that side of the stadium, but that I had to relinquish my seat as soon as the owners came), out came Wayne Bryan, who is the master of ceremonies on Stadium Court during the tournament. That’s another thing I had forgotten. Earlier in the press room I had stared at this familiar-looking man for a while, trying to figure out from where I knew him. He had a Prince racquet next to his laptop, and I still couldn’t figure it out. I guess it didn’t help that he had his hat and shades on, but still, I do remember watching old Tennis Channel reruns of Houston matches where Mike and Bob’s dad serves as the MC. Anyway, one of the first things Wayne Bryan said was that this was the largest Monday night crowd he’d ever seen at the tournament. Which is not that surprising when you think about it – this is an ATP 250, and normally there’s not much going on for the first few days. But people were slowly getting into their seats, and you could see that there would be a nice crowd. Soon after, a ball girl came out to sing the national anthem (she was awesome), and Gaël Monfils preceded James Blake out of the tunnel. Now, I know what you’re thinking. This is 2013, James Blake has been out of the tennis spotlight for a while, and Gaël Monfils has been injured so frequently that he’s out of the top 100. In fact, only 12 ranking spots separate these two men: Blake is ranked 91st, and Monfils is ranked 103rd. Still, James Blake is a household name in the tennis-loving United States, and Gaël Monfils is the kind of tennis pro that is popular wherever he goes. Hence, Blake-Monfils is indeed a rightful marquee match-up, even though both men are far from the lofty ranking highs they once achieved (Monfils is two years removed from his career-best No. 7 ranking, while Blake is seven years removed from his No. 4 career-best mark). Soon, the match started, and it was clear from the start that we were going to have some fun. James Blake was going to play like he always does: trying his best to hit as many crushing forehands as he can, and Gaël Monfils was going to shrink the court with those elite defensive skills that prompted many to think that the man who won three of the four Slams during his junior days would maybe one day win one at the senior level. One nice development from the start was observing how well Monfils was moving around the court. He had adapted to the “different” clay quite well, and as I’ve tweeted and written before, watching LaMonf slide on a clay court is a spectacular sight. Particularly if you remember that this is a 6’4″ man doing the sliding. Thus, we arrived at the first critical juncture of the match: a marathon 4-3 game on James Blake’s serve in which Monfils had six chances to break, and failed to convert any of them. In fact, by the time Blake finally held, Monfils was a abysmal 0 for 9 on break points. One thing I noticed about Monfils last night was how he seemed to struggle with second serve returns off his backhand wing. A lot of those nine break points came and went via errors on that particular situation. Maybe Monfils was a little over-eager to get a good return in. Maybe the nerves of being in a position to get a lead got the best of him. Again. it’s useful to remember that Gaël hasn’t been active on the ATP World Tour for almost a month and a half. To make matters worse, Monfils played a very loose service game immediately afterwards, double faulted away the break, and faced the prospect of losing a set in which he had so many chances to get a lead. What I find fascinating about this answer is that at that point of the match I started noticing that Monfils seemed a little out of breath. It takes time for pros to get the appropriate match fitness – even for someone as physically gifted as the Frenchman. Regardless, Blake stepped up to serve out the first set, and Monfils got a 15-40 lead. The surprise came when Monfils actually took that 10th break chance and evened the set, which was now destined for a breaker. Here’s what the crowd looked like at round the midway mark of the match. Pretty packed, huh? The tiebreaker started auspiciously for Blake, who ripped off a blistering cross-court forehand return winner to take an immediate lead. But then, two key unforced errors, one a backhand and the other a forehand, gave Monfils a lead that he wouldn’t relinquish. I like how Tommy Haas makes an appearance as the recipient of 22 aces from Wayne Arthurs … in 2002. Naturally, Isner and Karlovic make a combined seven appearances. Coming back from my tangent, the point I was trying to make is that Monfils served very well tonight, despite those six doubles. 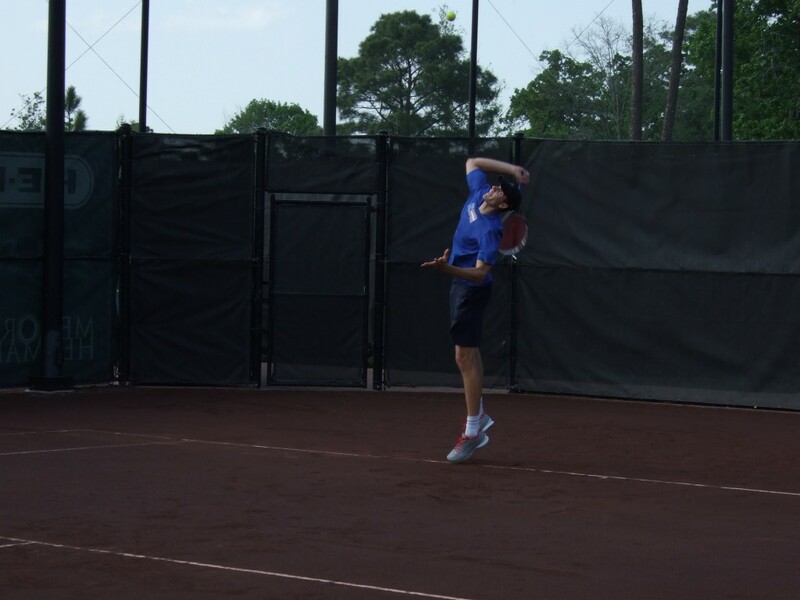 He was particularly impressive in the second set, where he only served up one double, added seven aces, served 59% first serves, and won 18 of 22 points played on his first serve. Early in the match I saw him hit a 138 mph ace that was as ridiculous as it sounds. One aspect I won’t forget about watching Monfils yesterday is how fantastic it is to see him shrink the court for his opponent. I tweeted during the match that Gaël is the king of getting to balls that are inches away from a double bounce. What’s more, he only sends back floaters if he absolutely has to. A ton of very low balls end up going back as drive shots, which is astounding. Related to this, I do want to make a point about the quality of the match. Was it Nadal-Verdasco at the 2009 Australian Open? Of course not. There were plenty of errors coming from both guys, off either wing. But there were plenty of fantastic points and phenomenal shot-making. 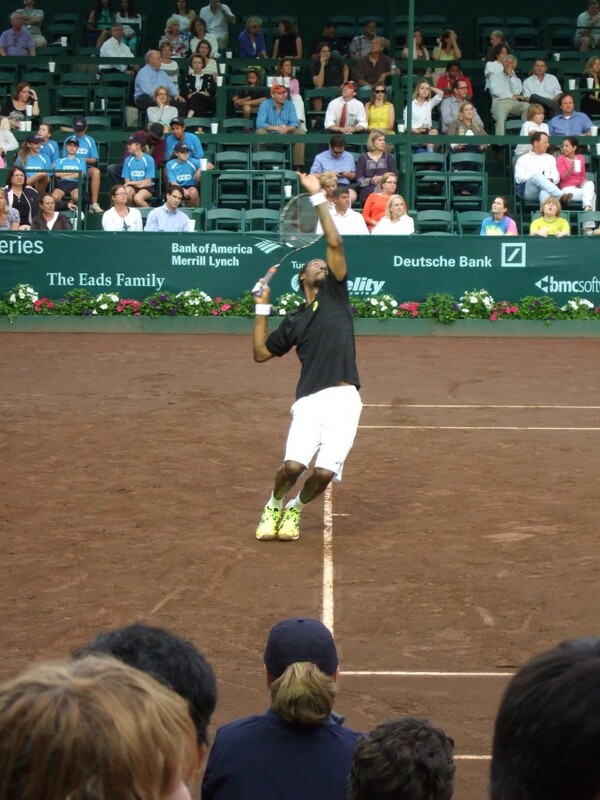 You could also feel the crowd’s awe whenever Monfils came up with a crazy get. 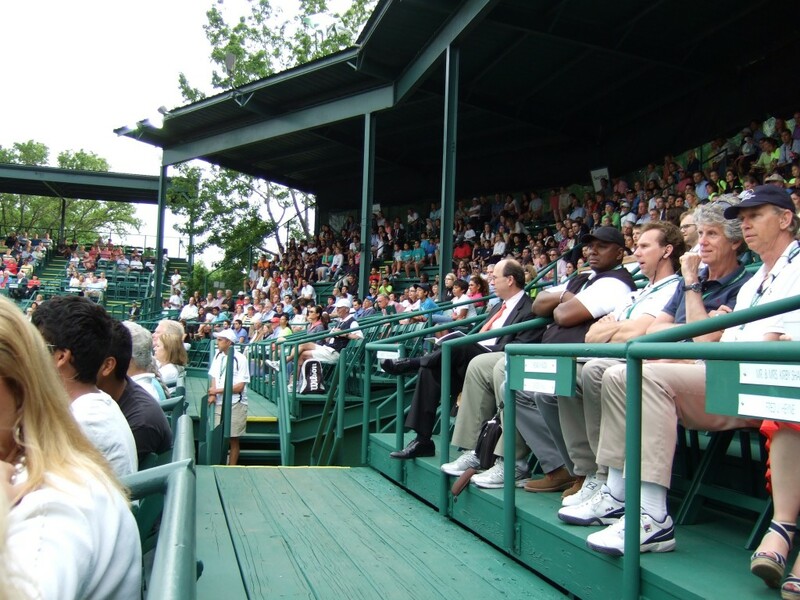 The folks in the stands particularly loved it when Blake would drop shot Monfils. The resulting cat-and-mouse game at net was always greeted with loud applause whenever it was over, regardless of who won. I’ll also say that the crowd was very, very fair. Sure. 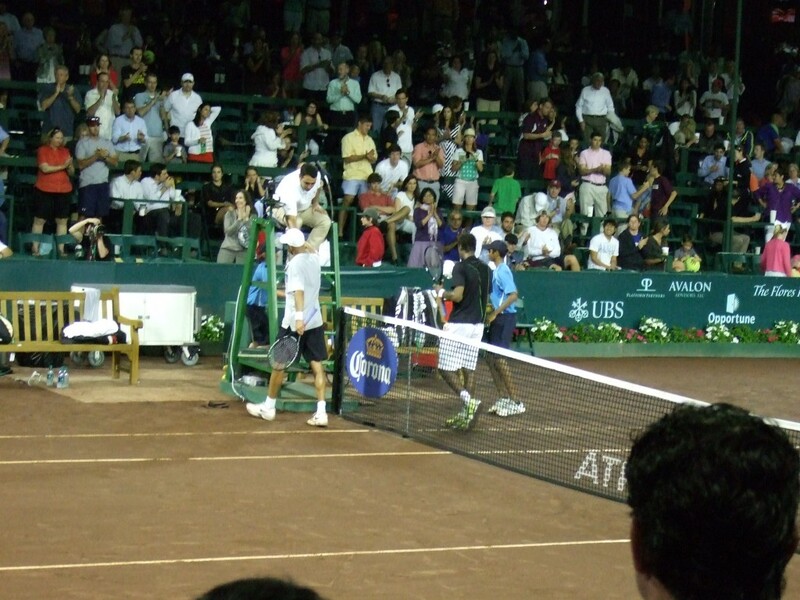 they wanted the American to win, but they were quite taken by the many fantastic things Monfils does on a tennis court. The second set began with what I thought was an unsurprising break in James’ favor. As I wrote, I thought Monfils looked winded, so it wasn’t exactly a shocker to see his energy levels go down after a tough, hour-long set. What was surprising was what happened at 3-0: Monfils held serve in no time, and then Blake played his worst service of the match. Soon, the break advantage had disappeared, and it really seemed like Monfils would take it from there. When Blake started his 5-all service game with a double fault, you could sense that the end of the match was near. And a few moments later, it was: Monfils broke James’ serve with ease, and served out the match at love, throwing in two aces that topped 130 mph. As you can see, Stadium Court was pretty close to a sell-out at this point. The crowd had been thoroughly entertained for almost two hours. Blake and Monfils definitely put on a show. An event couldn’t ask for more out of a Monday night match, right? Thanks to the two men, this match was a fantastic way to start off a tennis tournament. Gael was asked about the difference between this clay and the European clay. He said it’s “heavy and not very bouncy,” which is something that really stands out when you catch a match on the lower levels: the ball just doesn’t jump up. Roger Federer would love it here. Which is a great point to make. Monfils also knew the score of the last time he played Almagro: a 4 and 4 loss in the Acapulco final back in 2009. I’ll never forget Gaëls presser: it was the first one in which I participated, and given the cozy setup of the tournament (players come in, sit in a chair and the press sit a couple of feet across from them with nothing in between), you really get a feel for all the little gestures, all the inflections in a player’s voice. Since the small press room was crowded, I found myself sitting on the floor, inches away from Monfils. Kind of like a little kid listening to a story read by a kindergarten teacher. The point I’m trying to make is that being there helped me realize why Monfils is such a popular guy, not only with fans, but with players as well. He’s just genuine, a warm and welcoming soul. He’s soft-spoken, and you feel like there’s nothing he’s holding back. And that’s why I loved the above quote about not revealing his goal for the end of the year: Monfils even managed to make this little secret charming. When you read Blake’s quotes in print, it can come across as if he’s over-complimenting his opponents. Sure, it might rub some people the wrong way, but if you think about it, there are far worse ways to deal with defeat than being very gracious to your opponent. Plus, when you’re sitting not a foot away from him, you can sense that in his mind, he’s being honest. James was asked if he thought he would be coming back next year, and he didn’t know: he said that at the age he’s at, one serious injury could pose serious questions about the end of his career, so he’s going to take things as the come and not make any long term plans. I’m sure the Houston tournament would love to have Blake back next year: he’s a crowd favorite, and he was a big part of why last night was a rousing success. At that point I mentioned the Czech Republic, and James said that they’ll be moving to the number one spot in the nations’ rankings, something I didn’t actually know. As you can see, James Blake pays quite a bit of attention to Davis Cup. he was able to finish it in an hour but he wanted to give ppl some show. Great article Jose. After reading this I am going to find the match online if I can. By the way, I love you live analysis pieces. Thank you very much for the kind words, tennis watcher! About your question: I think they play the game in completely different ways, and approach tennis in a completely different way. It seems like Blake will try his hand on commentating when he decides to end his playing career (judging by his foray on the Tennis Channel). As for Monfils…who knows what’s in store for him. Anything is in the cards, really.